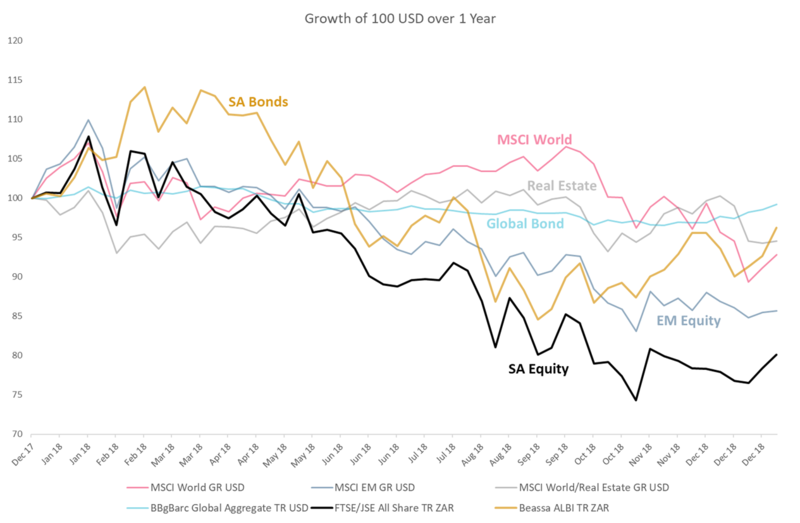 The past year was a tough one for both SA and global markets. 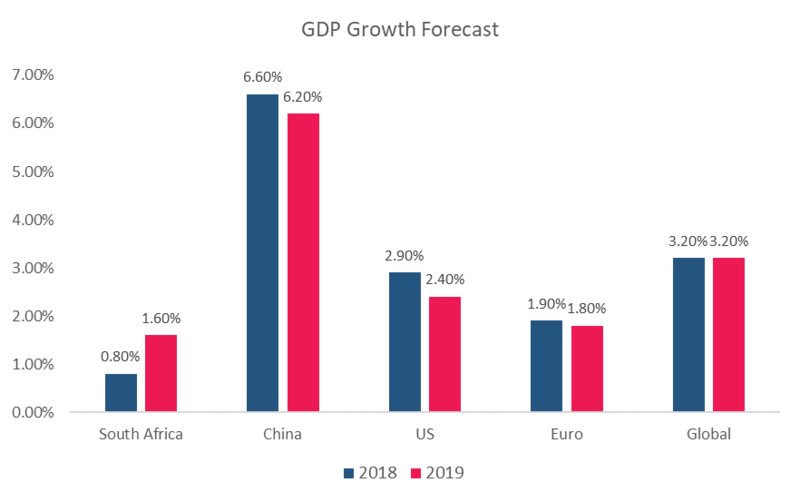 Politics and policy decisions with a direct negative impact on economic growth is a theme we carry into 2019. Investors are finding it difficult to shape expectations for the year. Risks often appear binary, with either a severely positive or negative outcome the result. We think that investors need to consider the risk and ask themselves: am I being adequately compensated for the risk? In equity markets, we think the current reward doesn’t justify the risk (FTSE/JSE All Share around 54�000). Considering you can earn 7.00% in cash and more from an income portfolio (see our article on income as a safe haven), we don’t think carrying a substantial amount of additional risk for an extra 2-3% is worth it. The market is volatile and uncertain, and resulting movements may provide more attractive entry points to equity markets. Is the market going into a big correction? We don’t think so, but also don’t see a case for great upside potential. In this article we will give you our take on where the market currently stands, what can be expected for 2019 and the largest risks that are potential stumbling blocks to our outlook. We will make the full version of the article available to subscribers on our free mailing list so sign up below if you haven’t already. South African equity underperformed both developed and emerging market peers. Considering the returns from a global perspective in US dollars, the magnitude of the underperformance becomes shockingly clear. Does the sharp decline in 2018 for SA equity now provide an opportunity to get in at a lower level? Possibly, the Top 40 looks cheap, but don’t underestimate the risks. Analysing the PE ratio on the Top 40 Index can be misleading since Naspers has a dominant weight in the index. We have stripped out the effects of Naspers and the conclusion remains the same: our market hasn’t been this cheap since 2012. Additional information like potential upside is covered in the full version of this article. You can subscribe for free to receive it by filling out the form below. South African listed property lost investors 25% in 2018. There were specific once-off factors like the fallout in Resilient-related companies back in January 2018, but the sector remained under pressure for most of the year. A concern is potential negative income growth from property, but we see this as unlikely in 2019. We anticipate growth near 5% (inflation) versus the 7% to 9% investors have become used to. There are quality SA properties that pay a dividend yield above 10% (higher than you can get on 10 Year Government Bonds). The sector faces some risks which we cover in the full version of this article. Subscribe for free using the form at the bottom of this article. 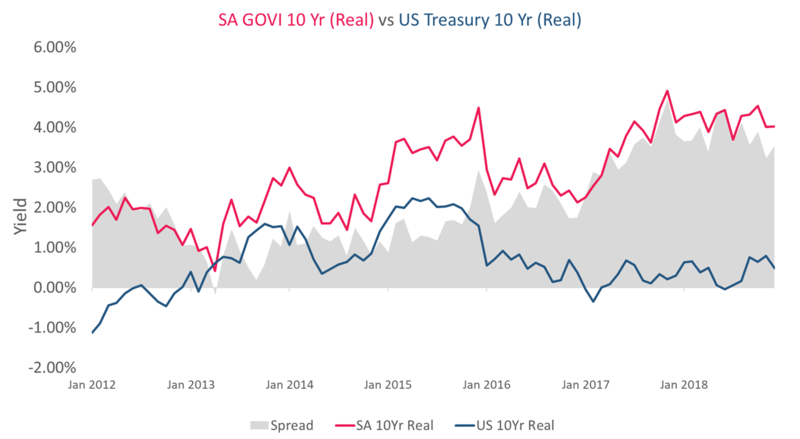 SA bond yields at the long end of the curve are providing investors with strong real yields, near the inflation plus 4% level. 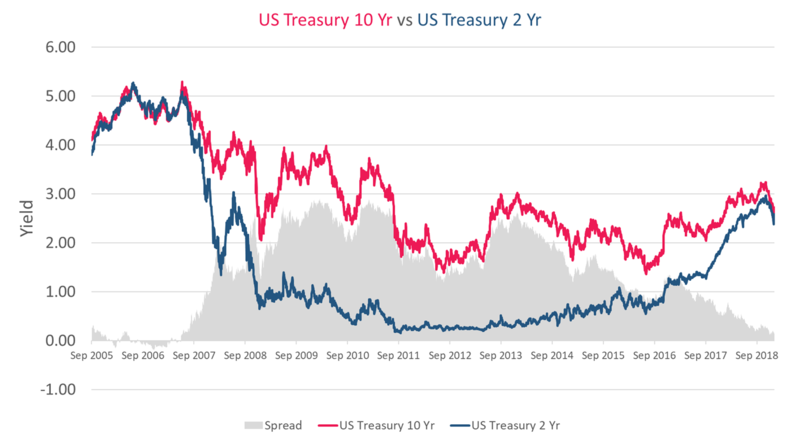 In comparison, US bonds are providing investors with around 0.50% in real yield, meaning the spread on real yield can see you earn 3.50% more from SA bonds than in the US. 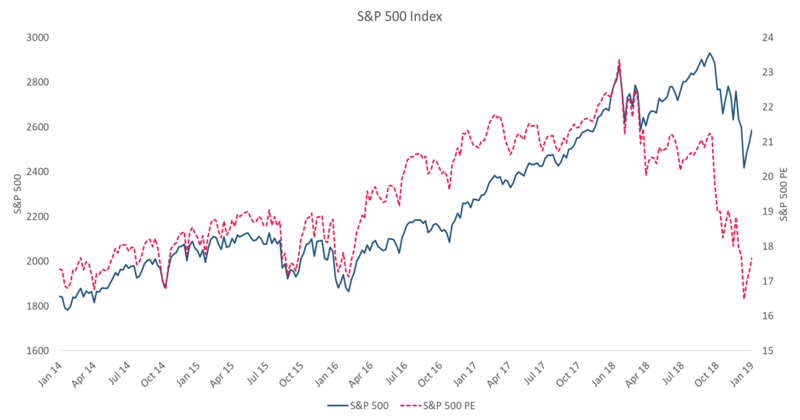 The last quarter of 2018 saw sharp declines in the S&P 500 while corporate earnings remained in an upward trend, and mostly surprised to the upside. Despite rising earnings, concerns that the bull market is nearing its end, has caused a flight into safe haven assets like gold and US Treasuries. These factors caused the S&P 500 PE ratio to fall from 23x to 17x, a decline of ~25%. Valuations for US equity was stretched, so don’t expect the PE to jump back to 23x within the next year. Concerns of risk to oil demand due to slowing global growth and higher than expected supply and stockpiles has seen the price of oil come down 35% in the last quarter of 2018. Brent Crude is trading close to $60 per barrel and we expect the price of the commodity to trade between $55 and $60 per barrel, representing a breakeven between supply and demand. The US dollar was relatively strong in 2018, but the currency’s appeal has deteriorated now that the Fed said it will hold off on rate hikes. In addition, President Trump’s “America First” policy and negative events that include the trade war and government shutdown are risks to the stability of the dollar. Countries are already starting to move away from the dollar as a settlement currency for trade and the trend could intensify with more countries moving away from the dollar as a reserve currency. This could weight on valuations for the currency this year. No surprise here, the trade war remains a binary overhang to both the US- and Chinese economies. The longer this continues, the larger the negative impact and we are starting to see the signs in the latest economic figures like slowing manufacturing activity in China. The trade war also poses a risk to SA’s economy as China and the US are SA’s biggest trading partners accounting collectively for 17% of South Africa’s total exports (2017 figures). The likelihood that Britain leaves the EU without a deal has increased. The impact should be negative and see the pound depreciate while it could cost the UK a staggering 7% in GDP growth over the next decade. 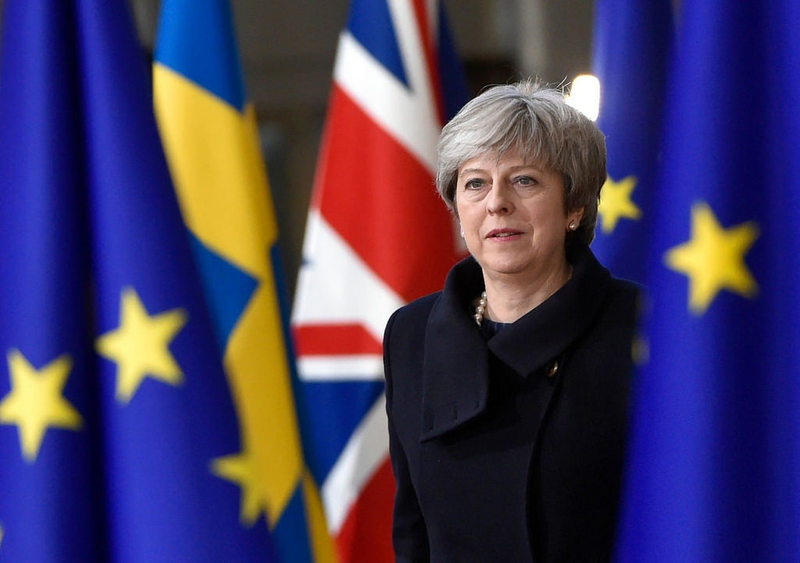 There has been increasing speculation of calling a second referendum or different Brexit altogether, both requiring an extension of Article 50. An attempt at predicting the outcome here is pointless as various scenarios have a similar probability. The deadline is 29 March. The ANC is expected to maintain its majority in this year’s elections, but how many voters have jumped the fence? 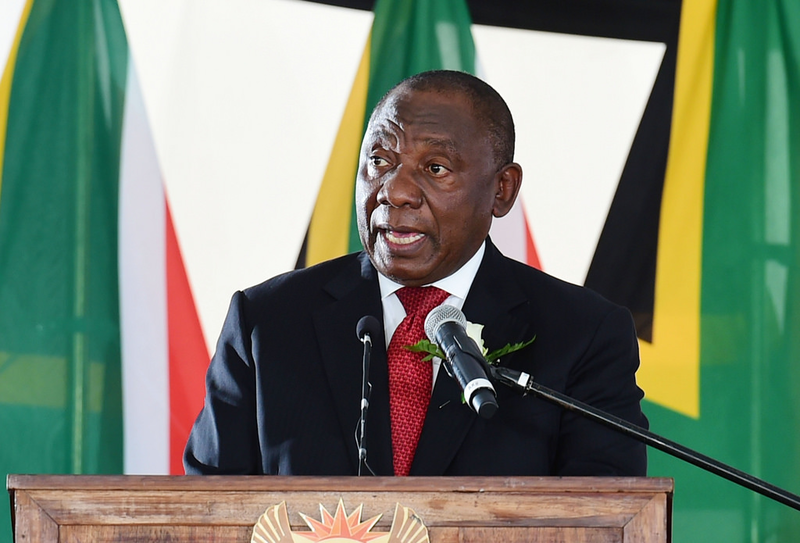 If the ANC loses too much ground in May, it could create a difficult situation for President Ramaphosa to implement reforms aimed at stimulating the economy. Questions have also been asked about the aim of policies like Land Expropriation leading up to elections and if this is something the ANC will follow through on. We talk more about these risks and highlight five additional risks that investors should take note of in the full version of this article, available to subscribers on our free mailing list. Sign up on the form below. Evidence suggests that the bull market is ending and global economic growth is slowing. The probability of a recession in 2019 is low. This probability increases through 2020 and 2021, and the market may adjust accordingly in anticipation. Our research on Recession Alert reveals how we calculate the expected recession date to be mid-June 2020. We do not expect SA or US equity to deliver negative returns for 2019, but volatility should remain given uncertainty on the binary risks. This may provide short term opportunities in equity markets. The FTSE/JSE All Share Index is currently trading within a range of 51�000 and 54�000 where it should remain without a catalyst to cause a break of support or resistance levels. A US-China trade deal or certainty on Brexit could be such a catalyst. We see a lot of value in the property market where you can find high quality companies paying attractive dividend yields. Meaningful risks that we have outlined seem unlikely to materialise and a return of investor confidence could provide a boost, but investors can be patient here as they have the advantage of earning high yields. We are also positive on SA income, delivering inflation plus 4% at low risk whereas other asset classes may not necessarily compensate enough for the current risks faced. The real yield from SA income is more attractive than US income. The rand/dollar exchange rate is forecast to remain between R/$13.50 - R/$14.00 as elevated risk from elections in SA should be offset by a weaker dollar. We recommend allocating income exposure to SA while taking a balanced approach to local and offshore equity. Receive this article in your mailbox for free and get added insights on the year from our team. Ian Stiglingh is a full time quantitative analyst, responsible for research and management of global and multi-asset portfolios. Ian completed his degree in Mathematical Science�in 2013 and his Honours degree in Financial Risk Management in 2014, both at the University of Stellenbosch. During his studies, Ian worked as an intern at Old Mutual Actuaries & Consultants as well as J.P. Morgan in Johannesburg, and has successfully completed the CFA program.